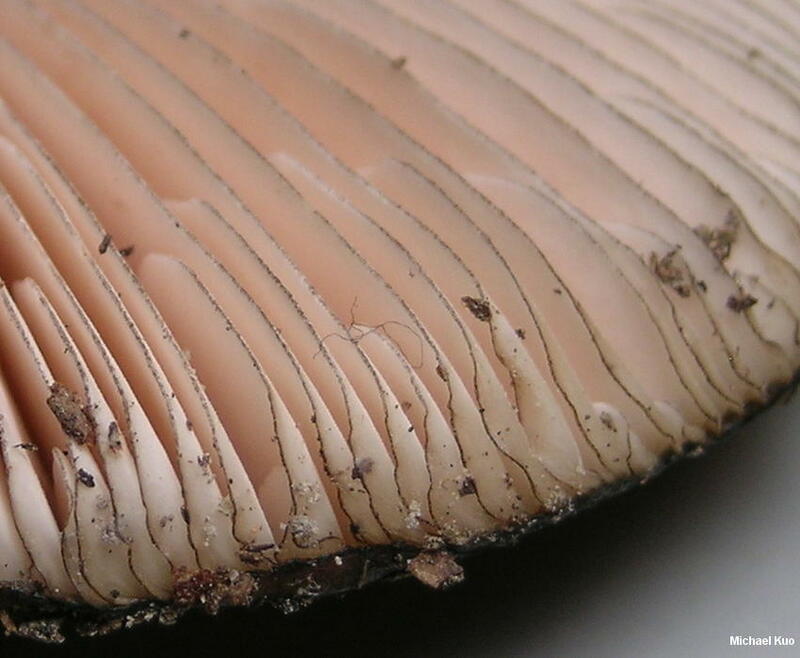 Like all species of Pluteus, this handsome mushroom is a wood-rotting saprobe with a pink spore print and gills that are free from the stem. 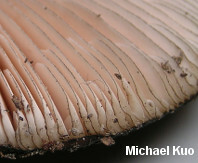 Unlike most other Pluteus species, however, it has "marginate" gills: the edges are dark brown or black, while the faces are pale at first and, with maturity, pink. Other distinguishing features include its preference for conifer wood, its dark brown colors, its fairly large size, and microscopic features (see below). Pluteus atrofibrillosus is very similar, though it is currently known only from the Great Smoky Mountains National Park. Its fibrils and scales are "more loosely arranged" (Justo et al., 2014), its spores are very slightly smaller, and its pleurocystidia have only two hooks. Ecology: Saprobic on decaying conifer wood; growing alone or scattered; summer and fall; widely distributed in North America. The illustrated and described collection is from Arkansas. Cap: 4-7 cm across; convex at first, becoming broadly convex or nearly flat--but often featuring a broad central bump; dark blackish brown to nearly black; with pressed-down, streaked fibers and often, over the center, small and inconspicuous scales. 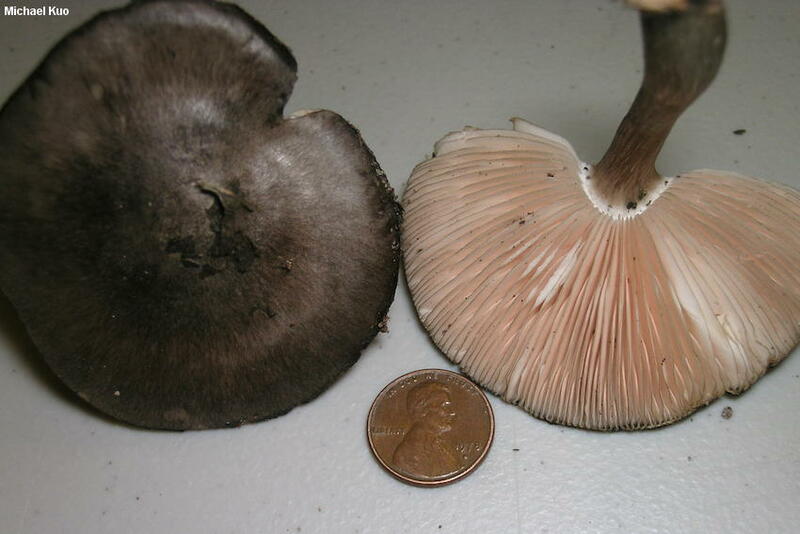 Gills: Free from the stem; close; whitish at first, becoming pink; short-gills frequent; with dark brown or nearly black edges from the margin to the stem. 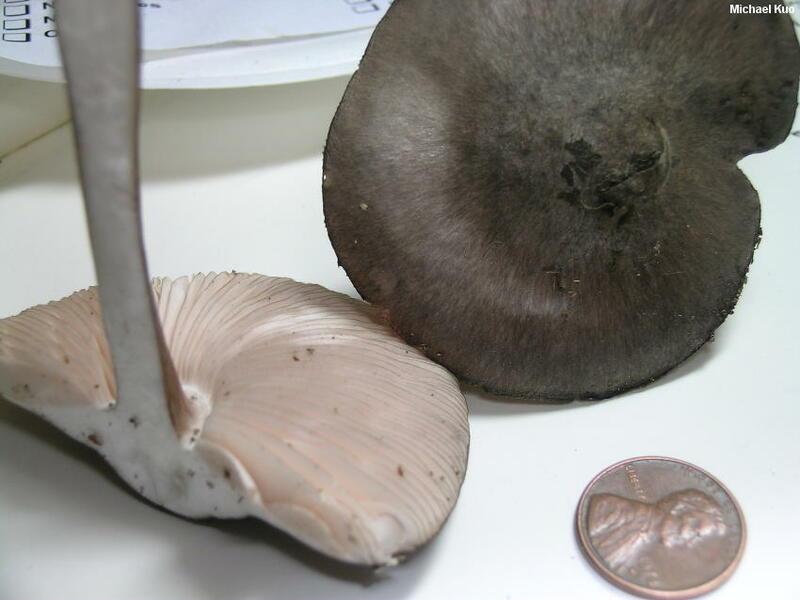 Stem: 4-7 cm long; up to 1 cm thick; with a slightly swollen base; dark brown; longitudinally fibrillose. Flesh: Whitish; unchanging when sliced. 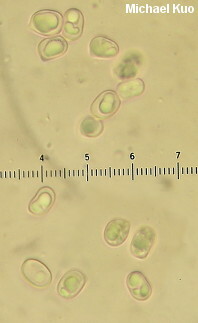 Microscopic Features: Spores 6-7.5 x 4-5 µ; broadly ellipsoid; smooth; hyaline and uni- to multiguttulate in KOH; inamyloid. Cheilocystidia cylindric to clavate or subcapitate; to 50 x 10 µ; thin-walled; with brown contents. 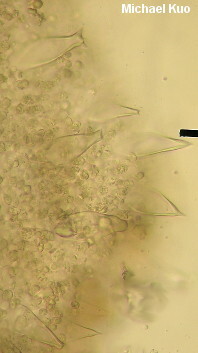 Pleurocystidia thick-walled; at first merely widely lageniform, but soon developing 2-4 apical hooks; 50-100 x 10-25 µ; hyaline in KOH. Pileipellis a cutis. Clamp connections present. REFERENCES: (Konrad, 1927) Kühner, 1935. (Singer, 1956; Smith, Smith & Weber, 1979; Phillips, 1991/2005; Lincoff, 1992; Banerjee & Sundberg, 1995; McNeil, 2006; Justo et al., 2014.) Herb. Kuo 10261304.